December 7 is Jim's birthday. After work Jim's friend a former Bowman employee came over to the camper and he brought Jim some beer and firewood. 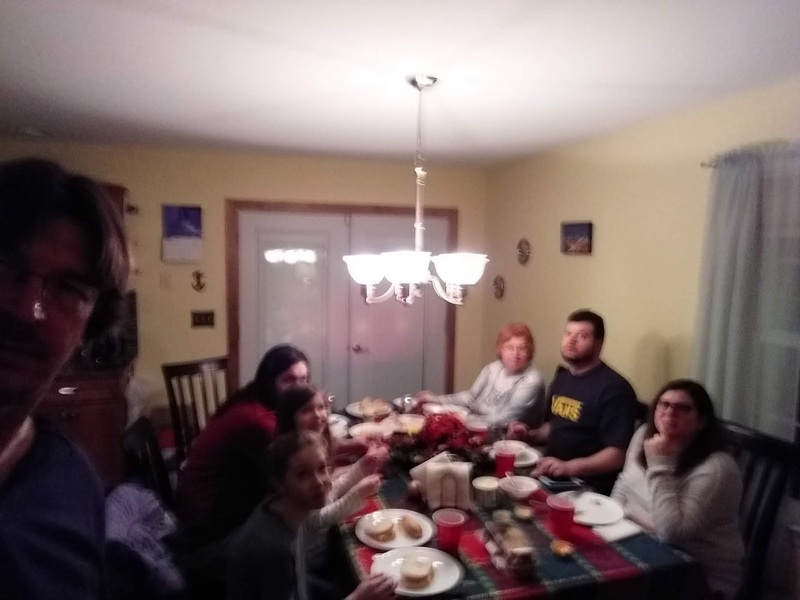 We were going to go out to dinner with them but his wife felt ill so he came over, I went to Wendy's and got drive-thru and brought it home we ate by the campfire and talked I went inside to watch TV. They had a nice guys night out even though it was cold. He wants to go full-time in a few years too, they talked a lot about that. I worked the weekend. Tuesday December 11th I had off, got my nails done went to Redner's when Jim got home we went to Esther's restaurant for dinner. Jim and I went back into Redner's bought some gift cards for our pre-Christmas get together with the boys and our granddaughters and Jim's mom . Thursday December 13th after work I had my last mammogram. We got ready to travel. Friday after work my last day we went over to Jim's mom's. I had made instant pot white chicken chili, and the day before I made creamy chicken wild rice soup so we took that over and the gift cards we bought she had sandwich fixings and Kerri brought cookies pumpkin pie. So everyone was there it was so nice here's a quick selfie Jim took of all of us. We left a lot later than we expected, home after 9:30. Things we plan to do before we leave will have to wait till the next day.